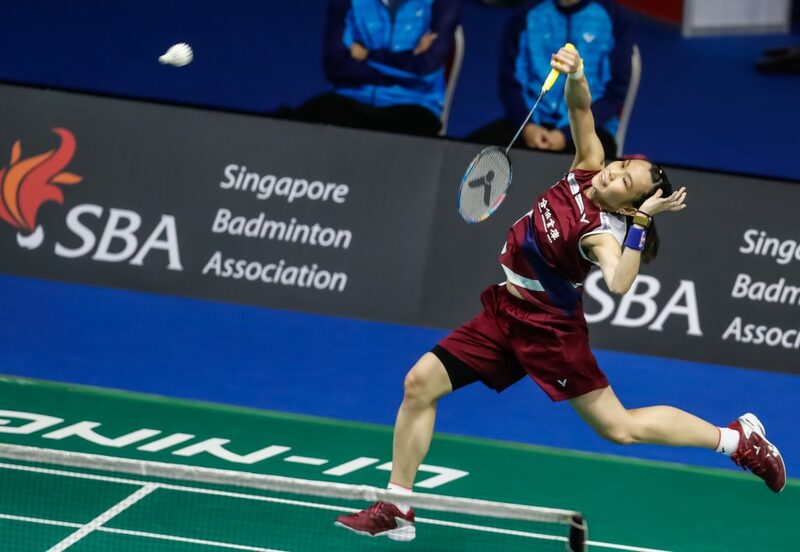 A 4,400 strong crowd at the Singapore Indoor Stadium witnessed world-class performances from the superstars of badminton on the third day of the Singapore Open. The tournament’s highest-ranked players move into the quarter-finals. 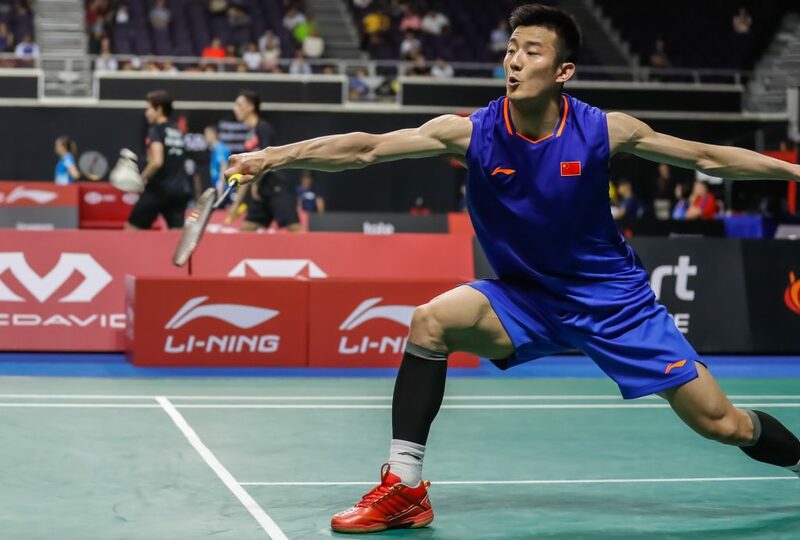 Reigning Olympic gold medallist Chen Long (below) had to labour his way to a 21-9, 15-21, 21-16 win over India’s Parupalli Kashyap in the longest match of the day (71 minutes). The Chinese will next face Anthony Sinisuka Ginting, popularly known as Indonesia’s “Giant killer”. Chen has already beaten Ginting once this year, at the Perodua Malaysia Masters, but still has an inferior head-to-head record, having won only three out of their eight encounters. “The stadium’s draft is very strong and unpredictable and I think the more experienced players will know how to deal with it. Every time I play against him (Kashyap), he puts up a very good fight. Tomorrow I will definitely give it my all,” said Chen. Defending champion Chou Tien Chen (TPE) came out on top in his match with Danish star Jan O Jorgensen. The Taiwanese won 21-18, 21-10 to set up a quarter-final clash against Sameer Verma (IND). World #1 Kento Momota (JPN) sailed through to the next round by beating India’s Prannoy H.S. 21-11, 21-11. The crowd favourite will next face India’s powerhouse Kidambi Srikanth, ranked #6 in the world. Denmark’s Viktor Axelsen advanced to the quarter-finals by edging out Kantaphon Wangcharoen (THA) 21-14 15-21 21-12. 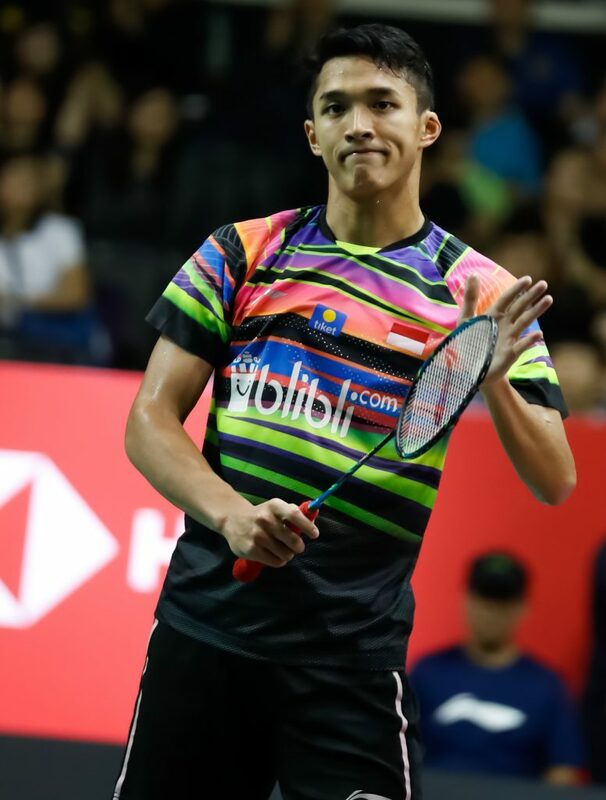 He will next face another crowd favourite, Indonesia’s Jonatan Christie (below), in a rematch of their Malaysia Open encounter. Women’s world #1 Tai Tzu Ying (below) eased through to the round of 16, beating Chen Xiaoxin (CHN) 21-15, 21-18. Tai is set to go up against Sung Ji Hyun (KOR), ranked 7th in the world. Tai and Sung have previously met 26 times, with Tai holding an impressive track record, winning 17. India’s Pusarla V. Sindhu showed her class by advancing to the quarter-finals by beating Mia Blichfeldt (DEN) 21-13, 21-19.
their Thai opponents Pacharapun Chochuwong and Kittipak Dubthuk 21-13, 21-7. The Singaporean pairing of Jaslyn Hooi and Crystal Wong were outclassed by the Chinese duo Liu Xuanxuan and Xia Yuting 21-6, 21-10. Marcus Fernaldi Gideon (INA) and Kevin Sanjaya Sukamuljo (INA) eased their way into the next round by defeating He Jiting (CHN) and Tan Qiang (CHN) 21-14, 21-17. Gideon and Sukamuljo will next face their fellow countrymen Fajar Alfian (INA) and Muhammad Rian Ardianto (INA) to whom they lost to in last week’s Malaysia Open final. “Although we were slow at the beginning, we found our rhythm and we played more safely, minimising our unforced errors. We need to be even more focused in tomorrow’s match,” said Gideon. Defending men’s doubles champions Mohammad Ahsan (INA) and Hendra Setiawan (INA) are also through following their victory against Koreans Lee Yong Dae and Kim Gi Jung. The Indonesian pair won 21-14, 21-17 and will next face Olympic silver medallists Goh V Shem and Tan Wee Kiong from Malaysia. Singapore’s men’s doubles pair Danny Bawa Chrisnanta and Loh Kean Hean bowed out of the tournament after putting up a good fight against the Chinese pair He Jiting and Tan Qiang. Chrisnanta and Loh’s exit marks the end of Singapore players’ journey in the tournament. “I feel that it is a pity because we didn’t secure the lead but overall it’s still quite satisfactory as we managed to put up a good fight and were able to stage a comeback from a large point gap in the second set. However, in the end it was our lack of composure to finish the game,” said Loh. “In the Singapore Open there are a lot of good players. Today is a good experience for us, they are higher ranked, so we are more focused on our improvement first. We have a lot of homework to do,” said Christnanta. Top seeds and world champions Zheng Siwei (CHN) and Huang Yaqiong (CHN) continued their winning run as they outclassed Indonesia’s Praveen Jordan and Melati Daeva Oktavianti 21-16, 21-13. Zheng and Huang also met Jordan and Okatavianti at the All England Open earlier this year where the Indonesians put up a tough fight. The Chinese duo only won in the decider. “I think we focused more on the first half of the match, the Indonesians are strong on the frontcourt and this resulted in many points being lost during the All England Open. We did a lot of prep work to ensure that we were ready to face them this time,” said Zheng. short in their quest to retain their title as they lost to Yuki Kaneko (JPN) and Misaki Matsutomo (JPN) 24-22, 21-10.